HOUSTON, Alaska -- An Alaska wildfire that has mushroomed in size was prompting help Monday from people offering their homes to scores of displaced residents and their animals. The fire north of Anchorage has led to the voluntary evacuation of up to 1,700 structures and has struck the heart of sled dog country, including 15 or so mushers who call Willow home. About 500 dogs have been rescued, according to Matanuska-Susitna Borough Assembly member Vern Halter, a former Iditarod musher. "Everybody's relieved that their dogs are safe and here, but the people that have lost their homes, they are dejected," Buser said Monday afternoon in a phone interview. "And people that their homes got spared are elated." 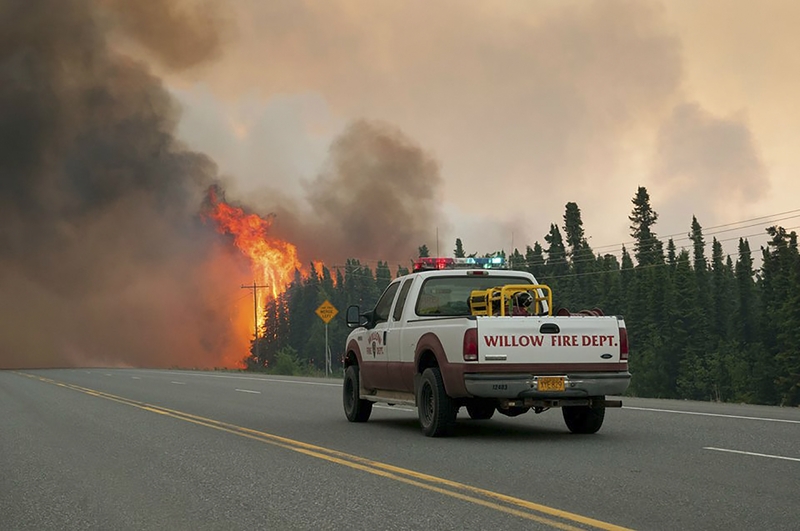 On Sunday, when the fire began raging, the word went out that dogs needed rescuing, said Steve Charles, a member of the Willow Dog Mushers' Association. People went out with dog boxes on the backs of their trucks to help rescue hundreds of dogs, according to Charles, who spent the day doing that. When he returned to his home south of Willow, the fire began threatening his neighborhood. "I didn't realize I would have to be evacuating myself," he said at the American Red Cross evacuation center at Houston Middle School. His own dogs were along a chain line attached to a fence. Charles said he's heard from neighbors that his house was spared. On Monday, Gov. Bill Walker took an aerial tour of the fire, which has burned at least 25 homes and up to 20 other structures including sheds and outhouses. Walker later said he accepted the Matanuska-Susitna Borough's request for state disaster declaration for the affected area. Fire information spokesman Tim Mowry said 210 residents signed in at evacuation centers in Houston and near Talkeetna. Officials said Monday afternoon that the fire was zero percent contained, with the weather expected to continue to be warm and dry. One firefighter has been treated for heat exhaustion. Residents with properties away from the fire have been taking to Facebook on a site dedicated to the fire to offer their homes and properties to displaced people. Among them was Kendra Zamzow, who was offering space for people and animals on her 2-acre property in the community of Chickaloon about 50 miles southeast of the fire. "I have plenty of room," she said. Also taking refuge at Houston Middle School was Robin Edgell, who had time only to grab one thing when fleeing her home in Willow: "Pictures, the only things that can't be replaced," she said outside a motorhome parked in the school's lot. The blaze was reported at just 2 acres Sunday afternoon and had burned through more than 10 square miles by early Monday, officials said. It chewed through forest and brush around Willow, in the Matanuska-Susitna Borough about 40 miles from Anchorage. "It's got a little wind behind, it has a lot of fuel and it's grown," said Tim Mowry, spokesman for the Alaska Interagency Coordination Center. More than 2,000 rural residents are spread along about 20 miles of the Parks Highway, which was intermittently closed. The blaze has been dubbed the Sockeye Fire for the avenue in Willow where it started and where homes were evacuated quickly after it was reported. The response was swift and strong because of the fire's proximity to homes. "We're throwing everything we can at it at this point," Mowry said. Tankers have unloaded retardant, and a helicopter dropped loads of water as more aircraft planned to join the fight. Nearly 200 personnel were battling the blaze and more were expected.